Successfully Added Wearable and Detachable Smart Sports Camera - 1080P, APP, Wifi, Magnetic Base, Waterproof, Car DVR, Hunting Camera (Red) to your Shopping Cart. Shocked by this Waterproof, Drop-resistant and dust-proof with fashion technology HD 1080P sports camera. With 30m underwater waterproof design, you could shoot wonderful videos or photos underwater. Compact body is easily carried, and with hand wearable and magnetic function make video record anytime and anywhere. With OV2718 sensor, could get excellent image quality even in low light conditions. What's more, it has built-in wireless Wi-Fi function key, downloads a dedicated APP to achieve camera with your smartphone, sharing the image with One-click through APP. Also, it has a wide-angle lens to allow you to have wider images experience. 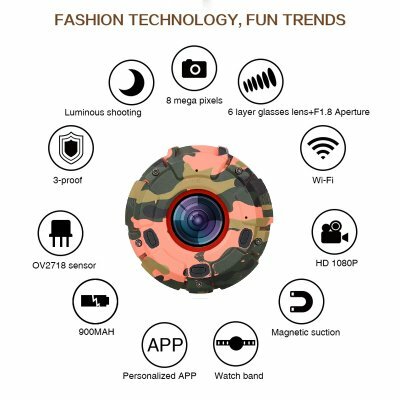 With its multiple uses, you could use it when you riding a bike, surfing, skiing, diving or hike outside, also you could use it as the car DVR or hunting camera with 900mAh Battery capacity to make up to 1.5hours working time.